This is the third Quilts of Love series book that I've had an opportunity to review here in the past couple of weeks. Tempest's Course by Lynette Sowell was such a great book. I couldn't put it down, once I got started. Before this, I reviewed The Christmas Quilt and Aloha Rose. The idea behind this series is that quilts have stories to tell, and the various authors are bringing together a variety of stories, whether women's fiction, historical romance, mystery, or a contemporary romance. This particular title is probably a contemporary mystery/romance. Kelly Frost, a textiles conservator, is invited to the Massachusetts coastal town of New Bedford to restore a 150-year-old Mariner's Compass quilt, with one stipulation: she must live and work in Gray House where the quilt is stored. Tom Pereira, whose heart seems as hard as the rocky coastline, is the caretaker employed by the mysterious absent owner of Gray House. Over the long-lit months as Kelly works to restore the quilt, she is drawn out of her self-imposed shell and embraces the family God has given her after her own family failed her. As Kelly reads stories in a journal penned by Mary Gray, she learns there is no transgression beyond God's forgiveness, but the real obstacle is forgiving herself. During her and Tom's journey to grace and love, an unknown force works to keep both of them from discovering a long-buried truth that will change their lives forever. My thoughts: I really, really enjoyed this book. The plot synopsis above was intriguing... Kelly's job restoring old quilts was a nice twist on the whole quilt theme. Going back to what was going on in the 1860s vs. what was taking place today was interesting as well. But it was the groundskeeper that caught my attention, and his relationship with his parents especially. I try when I write reviews to not go giving away much of the plot beyond what is in the description the publishers supply to me. And if I do exceed that, I try to make it be things you learn in the first couple of chapters, or to keep the information pretty vague. This may risk being a bit of a spoiler, but I don't think it really is. You see, as they go through the book, one of the things that Tom has been hiding is the fact that he is dyslexic. It isn't really any huge climatic plot point when that comes out. But I already knew. I just did. As the mother of a severely dyslexic teen, there was just something about Tom that screamed out to me. Not as a romantic hero to the story at all, but as a young man I wanted to protect and help. So, bottom line, I related best to the mother of the love interest. I think that means I'm officially getting old. I really loved the relationship struggles Tom has with his family, and watching them interact was a high point of the story. Of course, I wanted to see how the Mary Gray journal story would end, and how Kelly would emerge from her shell, and just who the mysterious home owner was. But Tom and his mom. They really kept me reading. I have no idea if Lynette has personal experience with dyslexia, and it isn't like this is a huge plot issue here. But it sure read "real" to me. I love, love, love when a character in a story happens to be dyslexic. Not a major issue, just part of his background. The book was also fun in that you did keep moving around so you saw things from various perspectives. That meant that, as the reader, you knew how some bits and pieces connected long before the characters figured it out. It was fun to watch them figure it out. 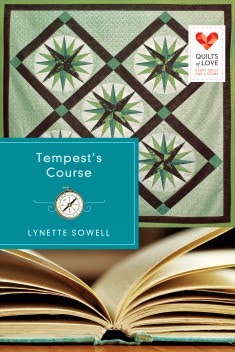 Lynette Sowell's Tempest's Course is the newest book in the Quilts of Love line, and Lynette is celebrating with a fun giveaway and joining Vannetta Chapman and Lisa Carter for the Quilts of Love "Christmas Bee" Facebook Party on December 10th! Enter today by clicking one of the icons below. But hurry, the giveaway ends on December 16th. Winner will be announced on the Quilts of Love Facebook page on December 17th. But wait! There's more. RSVP for the "Christmas Bee" Facebook Party on December 10th and connect with the authors from the Quilts of Love series, Vannetta Chapman, Lisa Carter, and Lynette Sowell, for an evening of book chat, quilt trivia, and Christmas traditions and gifts, PLUS get an exclusive look at January's Quilts of Love book!